Not a single blank space could be found on the steps of Parliament House in Melbourne at midday on Sunday, September 16. An estimated 2000 people accompanied by their much loved four legged friends, united for the third annual Puppy Factory Awareness Rally. 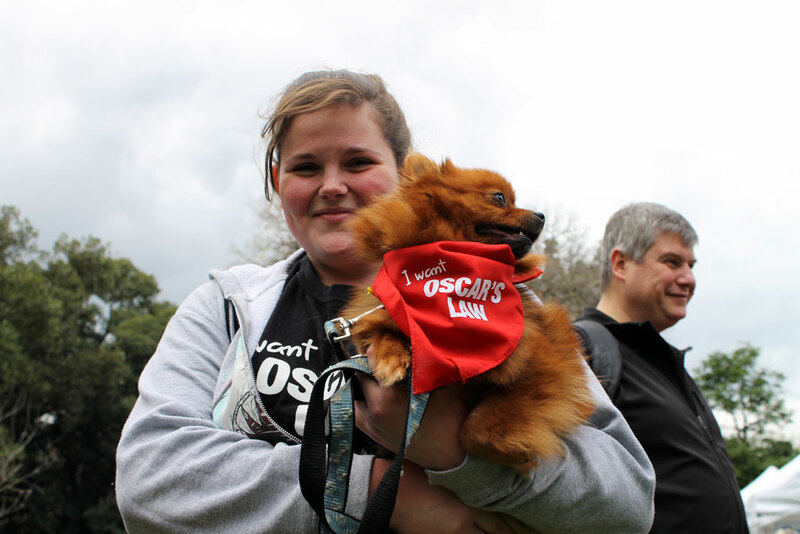 Dogs of all shapes, sizes and colours, sported the red Oscar’s Law bandannas, while their owners held placards reading “Abolish Puppy Factories”, “Break The Puppy Trade” and “We Want Oscar’s Law”. The rally then proceeded down to Treasury Gardens where a range of information, animal welfare and food stalls were set up. Rally-goers spent the afternoon meeting likeminded people, lending their support and learning more about the plight of animals in backyard breeding and puppy factories. Meanwhile, many dogs enjoyed the opportunity to socialise with others and show their support with their owners. The Lost Dogs’ Home marquee was back for a third consecutive year. The volunteer team were inundated with interest and did a fantastic job answering questions about the Home, Oscar’s Law and giving out National Pet Register free ID tags. Show bags were also available for a gold coin donation and merchandise was on sale with all proceeds going to Oscar’s Law. In total, 59 free pet ID tags were given out, while 500 show bags along with merchandise raised a total of $1,344 for the cause, topping last year’s figure of almost $700. The Home is proud to continue supporting the fight against puppy factories and back yard breeders and is pleased to see the campaign gaining awareness and strength with each year.